Chicago winters may not be for the faint of heart, but they certainly don’t put a freeze on the festivities. Sure, the temperatures take a tumble in the beginning of the year, but the city’s fun factor remains intact – especially when it comes to al fresco activities. Our advice? Embrace the cold, bundle up, and get ready to have a blast outdoors. And remember: Your cushy room at Ambassador Chicago will be waiting for you when you’re ready to warm up. A true taste of nature lies just moments away from the Loop at Northerly Island, a 120-acre peninsula adjacent to Museum Campus that juts out into Lake Michigan. Along with unobstructed views of the Chicago skyline, this nature preserve transforms into a wonderland of winter activity during Polar Adventure Days (January 26 and February 23, from noon to 4 pm). During a visit you’ll be able to check out Siberian huskies, wolves, and other winter-loving animals, as well as birds of prey from the Flint Creek Wildlife Rehabilitation Center. Sip some hot cocoa while you take in the scenery and fresh air, and if there are at least three inches of snow on the ground, you can even trek across the prairie in snowshoes (rentals are free on those days from the Northerly Island field house). Patio bars aren’t just a summer thing in Chicago, especially when there are s’mores to be had. 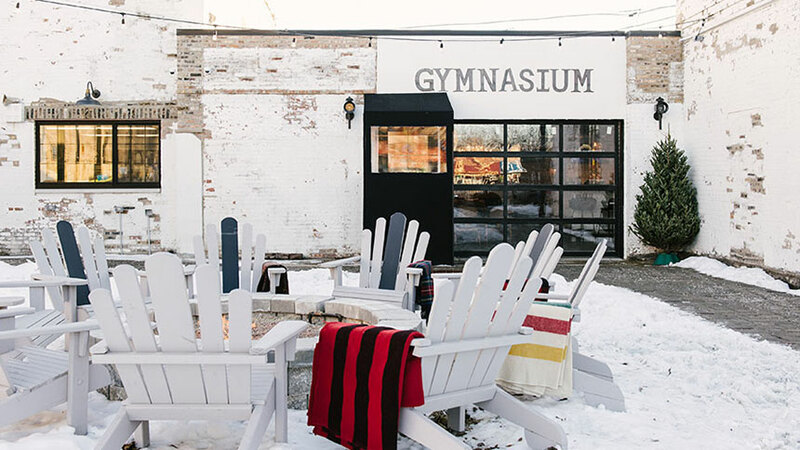 Head to Park & Field in Logan Square, a posh sports bar with retro flair, and cozy up near one of their sizeable outdoor firepits (they supply Adirondack chairs and wool blankets to dial up the cozy factor). Pick up a DIY s’mores kit from the outdoor Camper Bar – an absolutely adorable bar built out of an actual aluminum camper parked out back – and toast up some marshmallows. There’s also a fireplace and plenty of comfortable seating indoors. Getting “stoned” is good clean fun at Kaiser Tiger’s backyard beer garden in the West Loop. 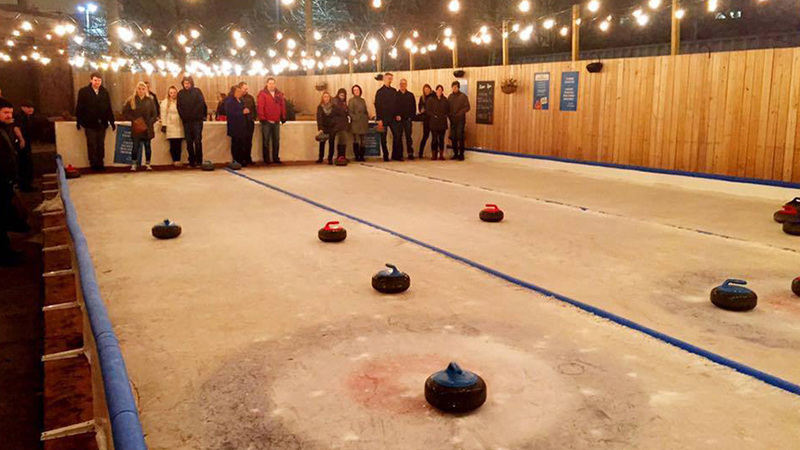 Grab three friends and rent one of their three ice curling lanes for half an hour ($40, cash only). You’ll quickly get swept away with this popular Winter Olympic sport that entails sliding large smooth stones towards a center circle on a rink using brooms. Warm up while you wait your turn near the outdoor firepits, and if you work up an appetite, indulge in Kaiser Tiger’s hearty menu of German-inspired delights, from sausages to schnitzel. Feeling really hungry? 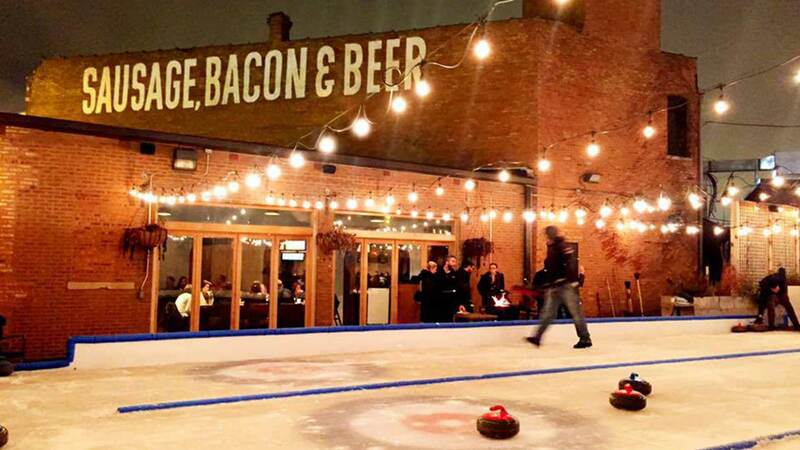 Have your curling crew take on The Bomb, which is five pounds of spicy beef and pork sausage stuffed with pepper bacon and wrapped in a brown sugar bacon weave. For one of the coolest views of the city, lace up some ice skates and glide along Maggie Daley Park’s stunning Skating Ribbon. Nestled between Millennium Park and Lake Michigan, this quarter-mile-long ice path offers an exciting change of pace from a traditional rink as it meanders among beautiful landscaping. The path even offers subtle changes in elevation throughout, all among the backdrop of the stunning Chicago skyline. 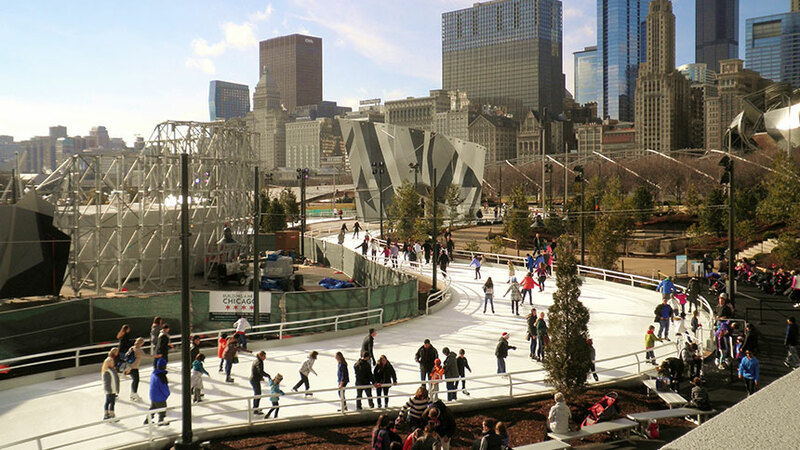 Admission to the skating ribbon is free and skate rentals start at $13. And don’t forget to grab a celebratory hot chocolate to enjoy after you wrap up your rings around the ribbon.